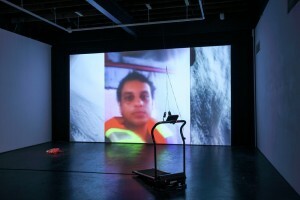 This performance is created from more than 25 hours of conversation recorded on-the-move. All the words heard were spoken by co-researchers in the project Walking Interconnections: Researching the Lived Experience of Disabled People for a Sustainable Society. 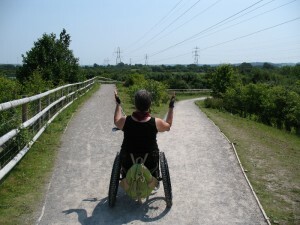 Walking Interconnections, and the resulting audio-play, Walk With Me, recognise and respond to the fact that disabled people’s voices have been largely absent from the sustainability debate. Representing one-fifth of the world’s population, disabled people have unique contributions, often overlooked, to help build resilient societies and communities. Setting as its foundational tenet the fact that disability does not mean inability, Walk With Me uses walking with as a way to identify and make tangible the everyday, embodied knowledges of disabled people – their habitual experiences of their environments, and their persistent enactments of resilience within these. What can we learn from disabled people’s experiences of walking? How might these experiences help us create more sustainable futures? Join us for a 30-minute audio walk. Listen out for performances of creativity, commitment, risk-taking, resilience and interdependency. Walk as if in someone else’s shoes. 1 Text from the audio play, available from Walking Interconnections website, <http://walkinginterconnections.com>, accessed 4 February 2016. 2 Fiona Wilkie, Performance, Transport and Mobility: Making Passage, Palgrave Macmillan, Basingstoke, UK, 2015, p. 18. ‘This is why I don’t go for walks’, Tiz tells me, as we pause the audio play Walk With Me to navigate a section of paving that has been dislodged by tree roots. ‘Because when you’re walking you’re in your rhythm and don’t have to think about it, whereas I’m in my chair getting colder and colder and trying to negotiate the terrain and dropped kerbs, and get round tricky paving slabs or roots sticking out all over the place. It’s not relaxing. I’m really concentrating the whole time – you know, everyone else is walking along having a chat and I’m absorbed in not crashing or falling off a kerb or something’. My sister and I are using Deirdre Heddon’s audio walk as a rare opportunity to go for a walk together, but it becomes clear that what it means to ‘go for a walk’ is not the same for each of us. Developed as one of the outcomes of the Walking Interconnections research project, Walk With Me shares dialogues between disabled people and sustainability practitioners as they take a walk together. The project ‘explores whether there are skills, insights or knowledge that disabled people can offer to our understanding of living sustainably, in particular recognising our interdependency with others and our environments’.1 In ten scenes, across 30 minutes, audiences are invited to walk while listening to conversations about, among other things, routes and risk, access and awareness, wellbeing and hybridity. One speaker reflects upon the desirability or otherwise of weeds; another considers the possibility of rethinking waiting time as an opportunity rather than a problem; many chart unexpected obstacles and the necessity of detours. Undertaking the walk with my sister – she in her wheelchair, me on foot – reminds us both that narratives of walking usually, and apparently unproblematically, adopt an able-bodied perspective. The critical literature on walking claims that it creates opportunities for reflective thought, that it is based upon physical contact between the foot and the ground, that it occurs at a pace of three miles an hour – claims that are often challenged by the experiences of people with disabilities. A photograph. Tiz and I stop for a selfie before we get much further than the end of my drive, and before we press play in sync. Looking back at the image now, I note three things: that I’m wearing fewer layers, in anticipation of being able to warm up on the walk, that Tiz is carrying my bag for me at this point, hooked onto the back of her chair, and that she’s experiencing this walk far closer to ground level than I am (I’m stooping to take the photo). I’ve written about walking elsewhere, noting that it sets the terms of reference for all other mobile practices. I’ve suggested that ‘ideas about speed, freedom, creativity, city, landscape, access and agency all become significant in a critical vocabulary because of the ways in which artists and others work through walking’2 – and I’ve attempted to interrogate this model by showing how it has been complicated by a variety of artistic works addressing other modes of transport. What Walk With Me reveals is that walking as a practice is already complicated by a range of augmented walking experiences: with mobility scooters, trikes, walking sticks and guide dogs. What it also reveals is that prizing autonomy and agency might mask the need to find more sustainable, ecological models of movement: ones that aim for interdependence rather than independence and that value shared wayfinding and reciprocal knowledges.